Arthroscopic ACL surgery is done to repair a partially or completely torn ACL (anterior cruciate ligament). ACL injuries account for around 40% of all sporting injuries and can lead to long term pain and instability. There are two types of ACL knee surgery commonly carried out depending on the severity of the injury, an ACL repair or an ACL reconstruction. 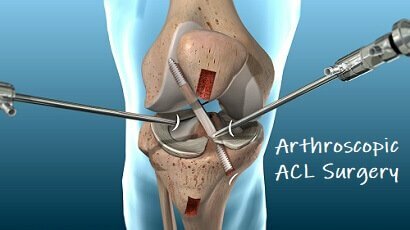 Most cases of ACL knee surgery are carried out arthroscopically these days. An arthroscopy is a minimal invasive surgical procedure where a special camera and surgical tools are inserted into the knee through small holes. It is commonly referred to as “keyhole surgery”. The big advantage is that the surgeon can assess the joint and repair any injuries without needing to fully open the joint. This speeds up recovery due to less trauma to the knee. Here we will look at how the ligament gets damaged, the types of ACL surgery that are done, how to decide whether you need surgery and what the alternatives are to surgery. 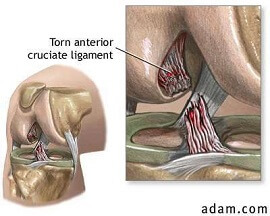 To find out more about how the ACL gets damaged, visit the ACL injuries section. Arthroscopic ACL surgery is indicated when there is significant damage to the ACL. 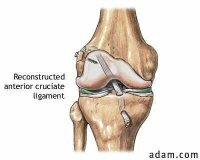 The ACL (anterior cruciate ligament) is one of a pair of ligaments in the middle of the knee joint, responsible for providing stability. Arthroscopic ACL surgery aims to restore the functional stability of the knee while retaining full range of movement. There are two types of operation commonly carried out to treat ACL injuries, both of which are carried out arthroscopically. 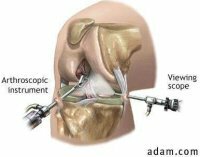 Arthroscopic ACL repair surgery is usually done when the ligament has broken off from the bone (known as an avulsion) but is still intact. The ligament is reattached to the bone and held in place. Repair is sometimes carried out if the ligament has partially torn. The surgeon sews the ligament back together so it can heal. However, there is a high failure rate so in most cases, it is better to go for a reconstruction rather than repair. If there is more significant damage, or there are ongoing problems with pain and instability, the torn ligament is removed and replaced with a graft, usually taken from your hamstring or patellar tendon. 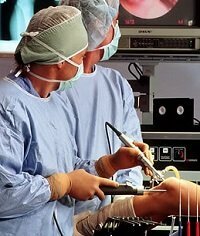 This is known as arthroscopic ACL reconstruction surgery. An ACL reconstruction is much more common than an ACL repair. You can find out more about what the surgery involves, the recovery process and common problems associated with surgery in the ACL reconstruction section. They may refer you for physio prior to your operation to get you started on a rehab programme. This will also have a positive impact on the recovery process. With both types of arthroscopic ACL surgery, two or three small incisions are made at the side of the knee. A special camera (known as an arthroscope) is inserted through one hole so that the surgeon can see the extent of the damage. Special tools (such as scissors or lasers) are then inserted through the other hole and used to repair or removed and replace any damaged tissue. The joint is then washed out with sterile fluid and closed. Arthroscopic ACL surgery is not a quick fix. Both procedures will be followed by months of rehab to build up the strength and stability of the knee and retrain proprioceptive function. You can find out more about arthroscopic ACL surgery in the ACL reconstruction section which looks in depth at what the surgery involves and the recovery and rehab process as well as common problems associated with the surgery. Many people recover from ACL injuries without the need for arthroscopic ACL surgery, even some people who have completely ruptured their ligament. It essentially comes down to two things, how severely the stability of the knee has been affected and what activities the affected individual is wanting to return to. Arthroscopic ACL surgery is recommended if the knee keeps giving way/buckling due to chronic instability. Any time this happens, there is a risk of damage to the other structures in the knee, particularly the cartilage and meniscus. It is important to avoid repeated giving way of the knee as if the meniscus tears, there is less protection for the knee bones and increased risk of developing arthritis. The need for torn ACL surgery will also depend on the activity levels of the affected individual. Someone who is wanting return to sporting activities is more likely to need surgery than someone with a fairly sedentary lifestyle. Not everyone who ruptures their ligament needs arthroscopic ACL surgery. Exercise rehabilitation for a partially or completely torn ACL looks to build up the strength of the knee muscles so that they provide enough support and stability for the knee to compensate for the torn ACL. It also helps train the muscles and other ligaments to provide proprioceptive feedback to gain more stability. It usually takes a few months of rehab to fully recover from a torn ACL. To find out more about the different types of arthroscopic ACL surgery including the recovery process and rehab involved, visit the ACL reconstruction section. And if you want to learn more about the ACL and how it gets injured, visit the ACL knee injury overview.